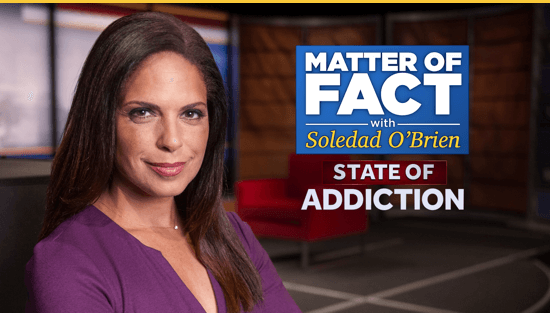 join us for an hour-long, live broadcast of “Matter of Fact with Soledad O’Brien” on September 13 at 10 PM EST on your local Hearst station. Washington, DC, Septemeber 8, 2017 – For the past year, “Matter of Fact” and Hearst TV Stations have participated in a nationwide effort by the National Association of Broadcasters to cover the growing opioid epidemic in the United States. More than 2 million Americans are addicted to opioids, according to the National Institute of Health, and Kaiser Family Foundation reports that nearly half the adult population personally knows someone who is addicted. We’ve committed to speaking with families who have lost loved ones, examining the causes of the crisis and exploring policy initiatives that may be able to help. Now, one year after making our commitment, we want to give a nuanced account of the State of Addiction in America and enlist your help in telling that story. As we discuss addiction in America, we are looking to hear from you – our viewers. We want to know about those you have lost in the opioid crisis as well as your own struggles and triumphs. There is no judgement in our journey to break down stigma and tell difficult truths. Share with us your perspective on what is not being addressed in the national conversation about opioid addiction and any stories of success in your community. At the end of the broadcast, we’ll compile a digital wall of remembrance to honor those we’ve lost and those still fighting.